The Blackhawks 2017 flag schedule has been confirmed, and sees them kicking off against Aylesbury Vale Spartans, West Essex Showboats and Ware Wolves on Saturday 15th April in a round of matches hosted by the Showboats. 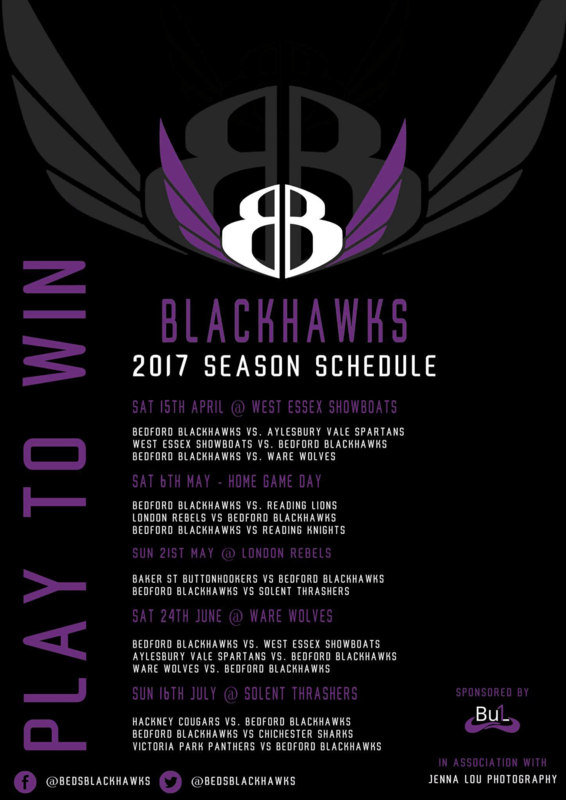 They are followed up a set of matches hosted by the Blackhawks on Saturday 6th and a trip to the London Rebels on Sunday 21st May. Three games at the Wolves on Saturday 24th June come next, before the regular season is rounded off with games against Hackney Cougars, Chichester Sharks and Victoria Park Panthers on Sunday 16th July. The Blackhawks are training this Sunday between 12pm and 3pm in Sandy on Sunderland Road. If you are interested in attending please get in touch either via Facebook, Twitter or the Contact Us page. The 2017 season will see the Blackhawks take place in the SEC North along side Aylesbury Vale Spartans, Ware Wolves and West Essex Showboats, all of whom competing for a spot in the 2018 Premier Division. During the 2016 season the ‘Hawks won once (38-33 in Ware on 25th June) and lost once (27-8 in Bedford on 16th July) against the Wolves, and lost each twice against the Spartans and the Showboats. The schedule for the 2017 season is expected to be confirmed shortly. The Blackhawks make the short journey to Aylesbury this Saturday (4th June) for their second round of BAFA Flag Southeastern Conference games. It will be the Blackhawks’ first games against the Rebels and the Knights, and also sees Wide Receiver Ross Sherratt and Cornerback PJ Pateman make their debuts for the team. We have been training hard since our last gameday, and with Coach Papworth’s help have been working to iron out the creases. We have a bunch of new guys who have all added something to the team. The buzz is really good and we are focused on trying to bring in our first win of the season. If you can’t make it to Aylesbury to watch the games, we will be providing regular updates via the Blackhawks Twitter and Facebook pages. The Blackhawks travel to East London this weekend for their first BAFA Flag Southeastern Conference games of the season. The games, which take place on Saturday, are hosted by the Victoria Park Panthers and as well as the Blackhawks feature the West Essex Showboats and Aylesbury Vale Panthers. The only previous encounter between the Blackhawks and any of the teams involved came during the Blackhawk Bowl in February, where the Spartans were victorious over the young ‘Hawks 32-0. Along with the rest of the squad I am itching to kick off our debut season in the BAFA Flag Leagues. Having worked with the majority of the squad for around half a year I have a great deal of faith that this collaboration of players could in time become something incredibly special. We have players on the roster who have natural ability in abundance, although this may not appear in the pre-season tournament scorelines. The players have got their heads down and worked week in week out on the lessons learned during those tournaments, and although we are up against arguably the three leading teams in the division this weekend we are looking forward to the challenge. The Blackhawks 2016 regular season schedule has been confirmed, and sees them kicking off against Victoria Park Panthers, West Essex Showboats and Aylesbury Vale Spartans on Saturday 14th May in a round of matches hosted by the Panthers. They are followed up three sets of matches in June on Saturday 4th, 11th and 25th hosted by Aylesbury Vale Spartans, Victoria Park Panthers and Ware Wolves. Then comes two rounds of matches hosted by the Blackhawks, on Saturday 2nd July featuring Aylesbury Vale Spartans, Chichester Sharks, , Bishop’s Stortford HighFlyers and London Barracuda, and on Saturday 16th July featuring the HighFlyers, Ware Wolves and Victoria Park. The regular season is rounded off with games against Reading Lions and Solent Thrashers on Saturday 30th July, in a round of matches hosted by Aylesbury Vale Spartans that also feature Bishop’s Stortford. The Blackhawks are back in training this Friday evening at Sandy Upper School. The session starts at 9pm, and is expected to cost around £4 per player. If you are interested in attending please get in touch either via Facebook, Twitter or the Contact Us page. Kick off times for all games are to be confirmed.